Free jumping with a jump chute gives your horse confidence over jumps and strengthens the muscles necessary for safe and proper jumping. It also allows him to practice where to put his feet and prepare for the next jump. As his rider, you need to be able to gauge his jumping ability and style, so that you can follow him over the jumps correctly without interfering with his body. Set your jumps up so they are against a wall or arena fence, either indoor or outdoor. The wall or fence creates a barrier to prevent your horse from jumping out that side of the chute. Set up a cross-rail jump to start; this is made by putting two poles between the jump standards, or posts, so they form an X in the middle. Don’t set it up more than 30 inches in height. Place a ground pole in front of the jump at the base of the jump standards. Construct a barrier on the opposite side. Use poles with hooks allowing you to clip chains, ropes or tape across. As another option, if you have enough jump standards, line them up vertically and attach poles high enough so your horse doesn’t think about easily jumping them. Put traffic cones beneath them as an additional deterrent. Upright plastic barrels are another option. 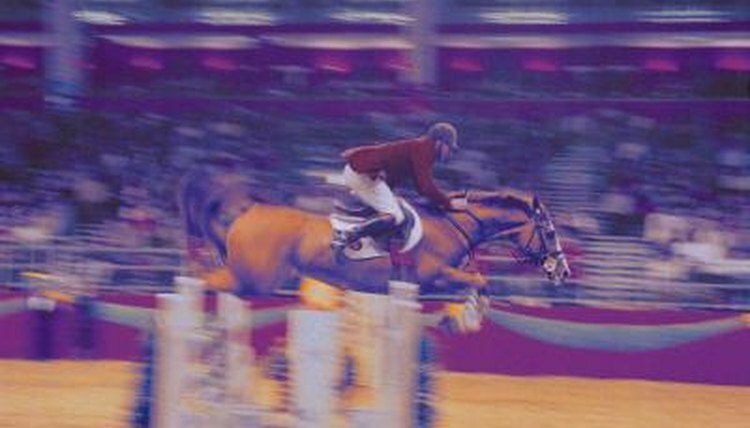 Add additional jumps once your horse has gone through the chute successfully, or if your horse is experienced in free-jumping. Set the second jump about 20 feet from the first one and just slightly higher, either another cross-rail or a 2-foot fence. Set the third jump about 23 feet from the second, making it about 2-feet and 6 inches high. To set up an oxer here, push another set of standards behind this third jump and put a rail up slightly higher than the front rail. Adjust these as your horse gains experience.  If you present a horse to a governing body for inspection and registration, look up their free-jumping requirements and re-create their set-up as much as possible so your horse is comfortable with it. ⚠ Don’t free-jump your horse with his reins; either remove them from his bridle and lead him with a lead clipped to the outside ring of his bit, or use a halter. If his reins fall while he jumps he can catch his legs in them and fall.